During the 6-month journey in my great-great-grandfathers’ steps, I will be wearing (not all the time!) 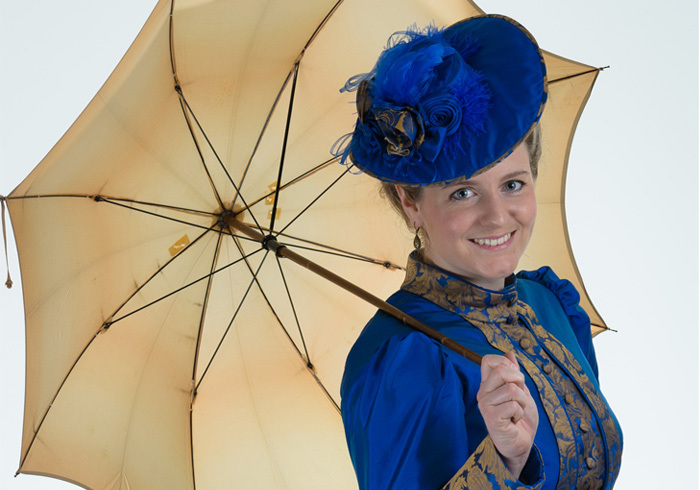 a dress in the style of 1880 – here is why. It’s funny how „the dress“ is one of the most recent ideas of the entire trip, but now has already become of such interest that the TV is showing its creation and friends ask me to open an own blog category of “how to travel with and survive in a difficult, spacious but absolutely stunning dress” (Source: itspurplegreen). In the fall of 2015, my mother actually came up to me asking “why don’t you travel in an 1880-dress?” – whereupon I simply thought “Why not? “– I never would have thought how all of this would eventually turn out. Where to get an 1880’s dress? 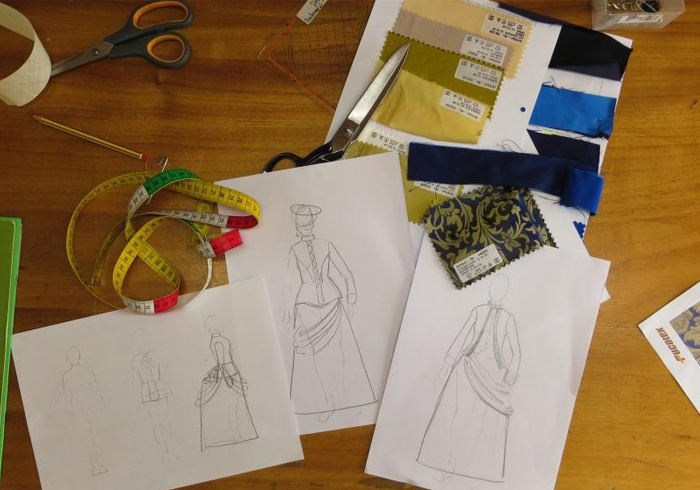 It dawned on me during my first phone call with the tailor I chose – Mrs. Kastner, who is a specialist in historical costume making (www.historische-gewandtschneiderei.de). We talked for one hour about ideas, fabrics and fashion. Afterwards I had to do more research on 1880’s fashion – and to decide what I exactly wanted. The first meeting at her workshop took about three hours where we talked even more about designs, fabrics, fashion and tailoring. I learned that different designs were possible only with certain fabrics (silk vs. wool) and that several layers of undergarments are necessary to create the looks. After long discussions and brainstorming I chose the colors blue and gold, silk as the main fabric and 4 pieces of undergarments, 2 pieces of dress and a hat. Less than two weeks before the first fitting, Mrs. Kastner called and told me that the Bavarian Television was making a story on her – asking me if I would be interested in being featured as a client with an interesting story. Of course I agreed – what an adventure! The following Sunday I found myself at the first fitting dressed in 1880’s undergarments surrounded by a tailor dressing me, a cameraman (and his camera in my face), an assistant (holding a microphone above my head) and an editor asking a lot of questions. It was a long, overwhelming and tiring day, but I got an idea of what the dress would look and feel like. During the second fitting, the dress was almost ready and Mrs. Kastner only took some last measurements and corrections. For the third and last fitting, the TV team came again to film the finished dress. The day was much shorter as we filmed less (and were more used to it than the first time) and I walked out the door with a suitcase full of dress and a hat box! The finished outfit is a 7-piece gorgeous outfit which does make me feel a little bit like time travelling. It’s not as heavy as it may look like, but definitely warm – but in 1880 one did not show much skin! As far as concerning shoes, my mother found beautiful modern and comfortable shoes (I will have to walk quite a bit) in dark blue and I got my great-great-grandmothers’ old umbrella which matches the color of the dress by chance. A friend of mine helped me with fixing the umbrella’s handle – it was broken. He printed a new one in 3D and made it to be screwed-on, so now it fits into the suitcase without the handle!